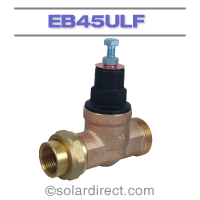 The EB45 Pressure Regulator features a half cartridge design that offers the performance of a high end, cartridge based valve and the price of a traditional regulator. The valve construction is similar to a traditional regulator in that it retains a separate spring chamber and adjusting screw, but offers the simplicity and maintenance benefits or a cartridge based valve. The EB45 comes factory set at 45 psi but may be adjusted between 10-70 psi.